On March 3rd, Potter & Potter Auctions will be offering, 'The Magic Collection of John Daniel' for auction. John Daniel was a well-known magician and an extraordinary collector and dealer of all things magic-related. This auction contains 491 pieces of magic memorabilia from his collection including vintage posters and photographs, books, props, equipment and costumes. 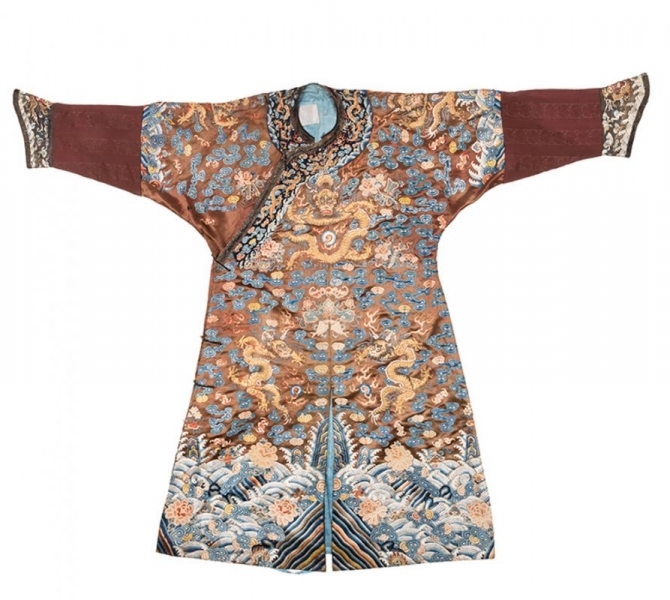 From an Asian Art perspective, some of the more interesting items in this sale are the silk embroidered Chinese dragon robes from the 19th Century that were actually worn by magicians during their shows. The first dragon robe is lot 304, Virgil’s Imperial Chestnut Dragon Robe. Made in the second half of the 19th Century, the brown tone denotes a duke wore this garment. The robe is typical in its shape and design and contains eight impressive gold threaded dragons flying on a heavenly ground, all above a multi-colored ocean. A ninth ‘hidden dragon’ would reveal itself if you lifted the front-right flap. 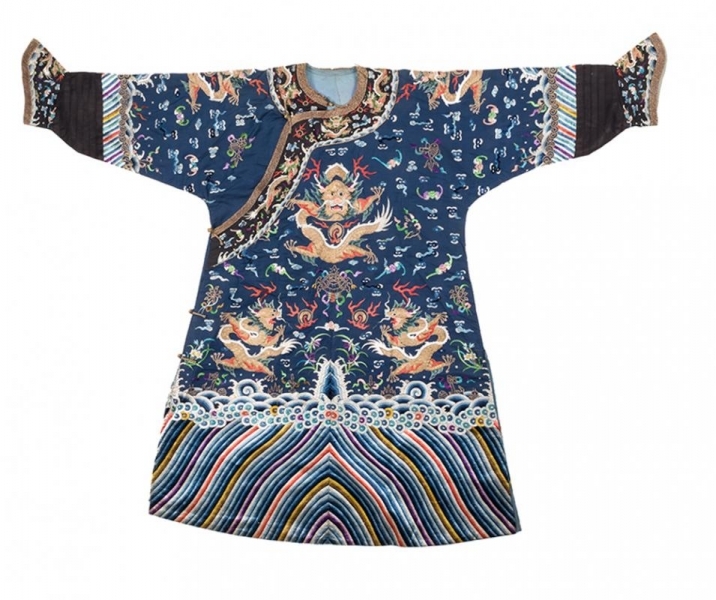 Similar in design, the next robe is lot 305, Chinese Imperial Blue Dragon Robe. Since the gold threads are more densely packed and the dragon’s head is atypically large, this example would date to the mid 19th Century. The blue color suggests that it was made for a prince or a close relative of the imperial household. Both of these robes belonged to the famed American magician ‘The Great Virgil’ (Virgil Harris Mulkey/1900-1989) who wore them during his performances. Historically, Chinese dragon robes were worn by members of the imperial court – a tradition that started in the late 6th century and survived until the early 20th Century collapse of the Qing Dynasty. Despite being mythical beasts, dragons were known to be the ultimate animal due to their fierce and transcendent nature. These creatures were able to exist in all quadrants of the world including the heaven, earth and oceans. In consequence, dragons were extremely revered and held the utmost symbolic significance with Chinese royalty. For the early 20th Century magicians, the dragon (and dragon robes) took on a whole different meaning. Instead of representing Chinese imperial status, they showcased the perceived mysticism of the Orient. Dragons were believed to have magical powers, thus elevating the magician’s status to their audience. The paying public wanted to believe that these shows displayed actual feats of magic, and not just textbook illusions and tricks. This is showcased with Lot 360, a Chung Ling Soo Postcard. 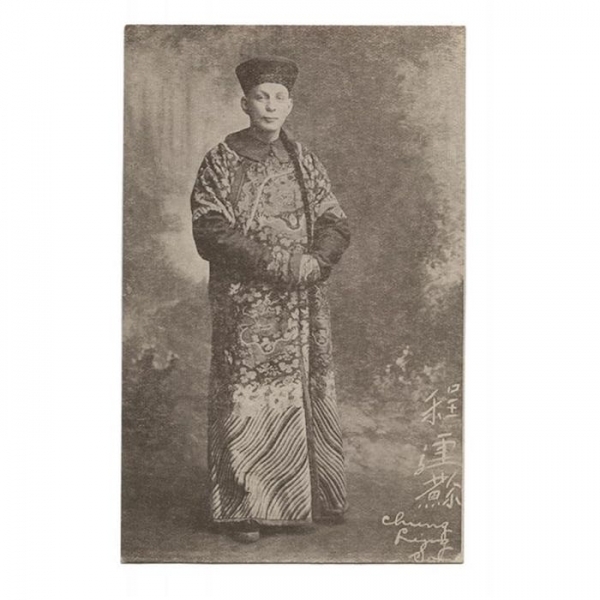 Despite being dressed in a 19th Century, Chinese dragon robe and a braided queue and cap in the Manchurian style, this is in fact the American magician, William Ellsworth Robinson (1861-1918). He took on this particular stage persona around 1900 when he took a job offer in Paris for the role of ‘Chinese Magician’. To play the part of a Chinese person, he never spoke a word and created an elaborate backstory of being an orphan raised and trained by Chinese magicians. 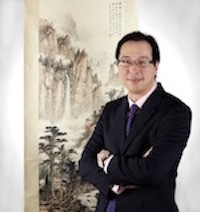 The Chinese attire and appearance brought him much credibility and accolades from his target audience. Unfortunately, Chung Ling Soo died during a 1918 London performance when his ‘bullet catch’ act malfunctioned. Even Chinese magicians performing in the West received more validity by wearing Chinese dragon robes. This is exemplified by Lot 364, an Inscribed and Signed Photo of Long Tack Sam. 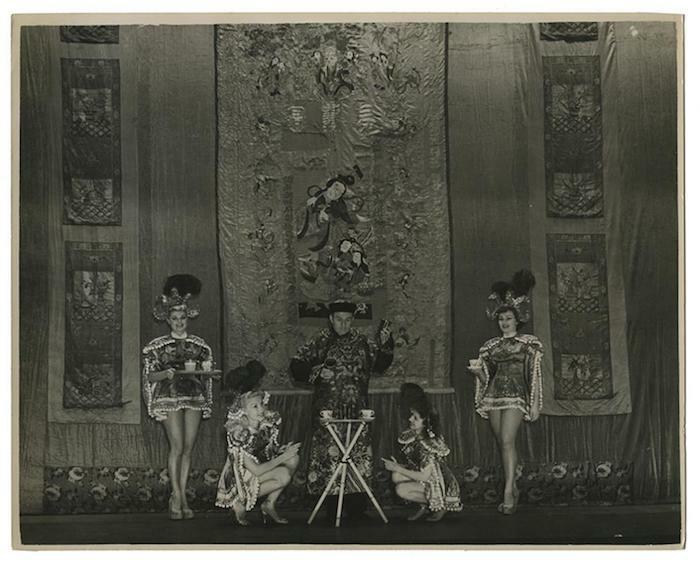 Born Lung Te Shan (1884-1961), he was a famed acrobat and illusionist. 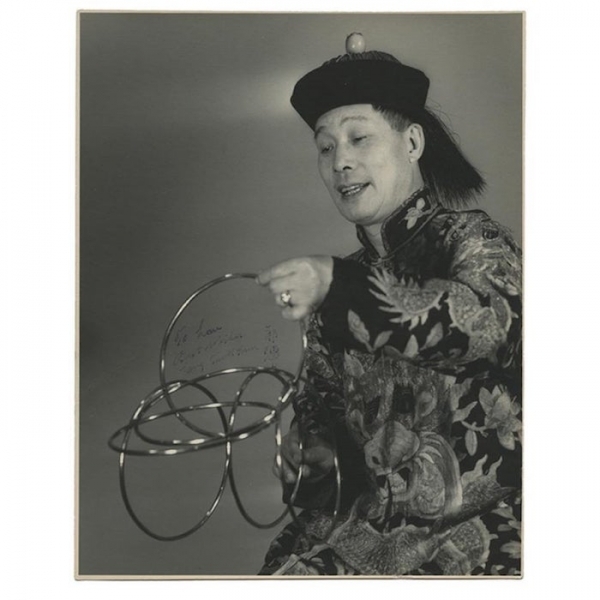 In this photo where Long Tak Same is performing ‘Linking Rings’, he is not actually wearing a dragon robe but rather a Chinese opera robe from the 1920’s. This robe still contained a large dragon design and would have been extremely elaborate with bright colours and gold and silver threads throughout. Another interesting piece from the Potter & Potter's sale is Lot 223, Voice from the Great Beyond, Whispering Buddha - this contraption was made in Los Angles by F.G Thayer in the 1920’s. 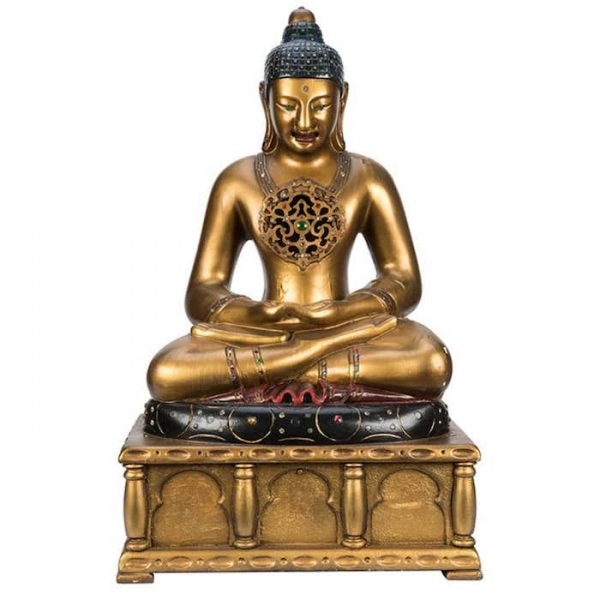 It depicts a meditative Buddha built with an early voice box. It would have responded to audience questions during a performance and is the only known example in existence. This item again showcases the Western audience’s belief that Eastern culture had innate magical powers and the ability to connect with the supernatural. Click here to view the full catalog for Potter & Potter Auctions, The Magic Collection of John Daniel sale coming up on March 3rd.